Old Truck Show at Sugar Bowl's Mt. Judah Lodge May 29 late morning until early afternoon when the trucks leave for the Antique Trucke Historical Society convention in Reno. or go to donnerpartyhike.com to sign up and get information. 2019 will be the sesquicentennial of the transcontinental railroad celebrating the amazing feat of spanning the continent with rails and setting in motion what became The Truckee-Donner Summit-North Tahoe area. Without the railroad there would be no Truckee, North Tahoe, or Donner Summit as we know them today. The railroad brought travelers and emigrants and made crossing the Sierra relatively painless. It enabled the local lumber and ice industries. Because of the railroad, Truckee (previously named Coburn’s Station) was born. It brought artists and writers to capture the beauties of the area. It brought tourists. It made early winter sports successful and spawned the ski and snowboard industries in the area. The first transcontinental highway followed the railroad’s general route as did the first transcontinental telephone line, the first transcontinental air route, and the Interstate. In a larger sense the transcontinental railroad was immensely important to the State and the nation as well. It opened California to the country and the country to California. It enabled the products of California to get to the rest of the country and provided a larger market for the goods from the rest of the country. The railroad united the country and opened the American market to goods from Asia. The transcontinental railroad was a revolution for the area and a revolution for the country, given the change it enabled and engendered. Given the importance of the railroad the 150th anniversary should be celebrated. To that end the Donner Summit Historical Society, The Truckee Donner Historical Society, and the Truckee Donner Railroad Society have joined to design a set of activities and events in the area from May 10 (the date of the Golden Spike's driving in 1869) to Labor Day, 2019. The components of our sesquicentennial celebration will be: a logo contest to design a trademark for the celebration which will be open to the adult public and students. Runner up designs will become stamps (stamp pad type). Visitors and locals will be able to pick up "passports" which they will take to locations around town and on Donner Summit that have historical displays. At those locations people can get their passports stamped. All the contest entries will be displayed at an art show opening on May 10 at the Rec Center. We will have "Then and Now" displays in downtown Truckee so people can see what parts of town looked like long ago. There will be music on the China Wall celebrating the heroism of the Chinese workers. We will have weekly articles in local newspapers during the summer highlighting the history and we may compile those into a book. There will be walks, hikes, and talks and presentations during the summer in various venues. There will be downtown walking tours. There will hopefully be a book signing for the Stanford University Chinese Railroad Workers Project new book. We'd also like to have docents at historic railroad sites during summer weekends. Although the celebration is of the railroad's sesquicentennial, history experiences will not be limited to the railroad. The area's history from 1862 to 1926 will be celebrated. The Sierra is a great barrier and there are only a few passes through the great barrier to connect California with the rest of the country. One of those passes is Donner Pass, the area colloquially known as Donner Summit. Through that pass have funneled many stories – stories of heroism, adventure, excitement, pathos, courage, and tenacity. Those stories encompass the very best of the human spirit. Couple that with Donner Summit being the most historically significant square mile in California and maybe the entire Western United States, and that most of the stories have almost been forgotten, their resurrections ought to be really interesting. They are. 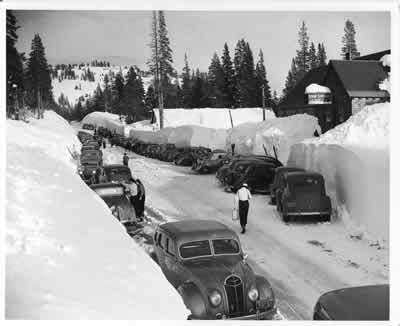 Donner Summit is the most important historical square mile in California and maybe the entire Western United States. Native Americans crossed for thousands of years. The first emigrants to arrive in California with wagons came over Donner Summit. The first transcontinental railroad, the first transcontinental highway, the first transcontinental air route, and the first transcontinental telephone line all crossed Donner Summit. The first person to bicycle around the world went over Donner Summit, as did the first person to make a motorized crossing of the U.S. and the first people to attempt to cross the country in an automobile. That’s just a bit of the richness that is Donner Summit history. Then there are the fun small stories: frozen turkeys roosting in the trees, the two-story out house at the Summit Hotel, blindfolded mules, and the Spider Dance. 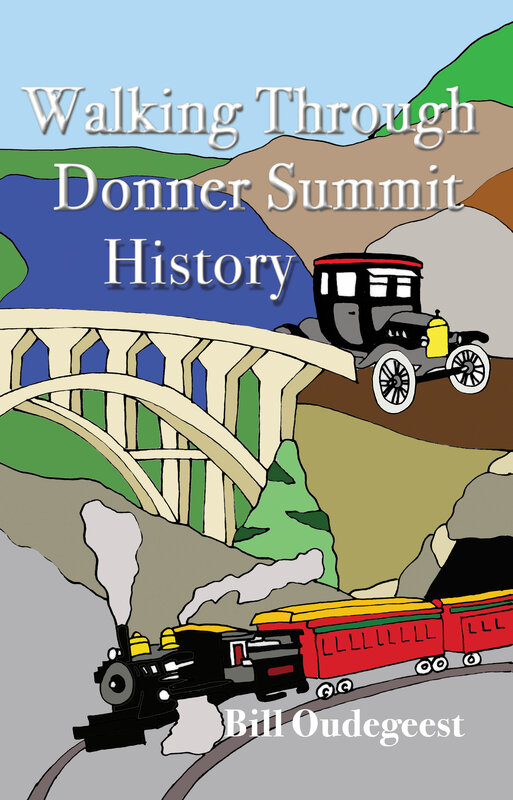 You can walk through Donner Summit history, where it all took place. In the walks described here you will read the stories, “hear” history through people’s words, and see the historical photographs that bring the history to life. 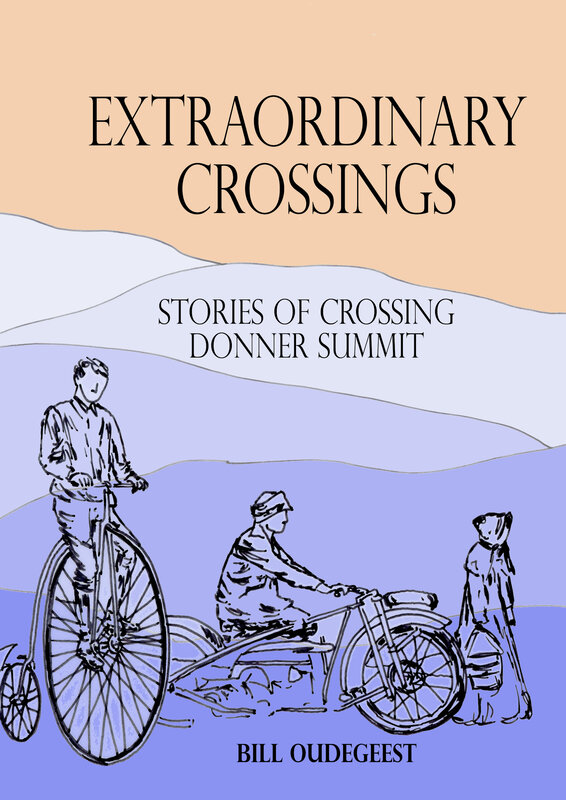 You can purchase the book on line (link above), via regular mail, at the Soda Springs General Store, at the Donner Summit Historical Society, at the Donner Memorial State Park, or via regular mail (P.O. 1 Norden, 95724) The cost is $25 which includes sales tax, shipping and handling. 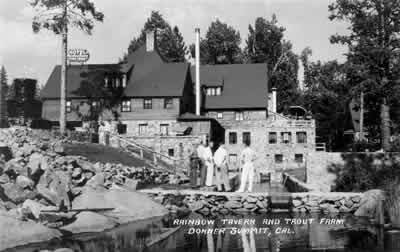 Above: Rainbow Tavern and Trout Farm. People could fish for trout right outside the hotel and have their fish cooked. Today the Trout Farm is a lawn. Below: Outiside the Soda Springs Hotel on Highway 40. People parked all along the highway and then went skiiing and patronized buisnesses.